Only recently a particle physics experiment that spanned two borders caused quite a stir when scientists announced that they thought they had measured particles travelling faster than light. It turned out that faulty equipment was to blame for the erroneous measurement. However, as our speaker Prof Robert Lambourne from the Open University explained in his talk "Faster Than Light Galaxies", there are cases when this universal speed limit is surpassed. A ray of sunlight travelling at approximately 300,000 kilometres per second takes about 8 minutes to reach the Earth. This figure for the speed of light is valid for the vacuum of outer space where photons of light travel relatively unimpeded. However, in different media such as glass or air, light slows so that, for example, the speed of light in air is about 90 kilometres per second slower than its quoted top speed. 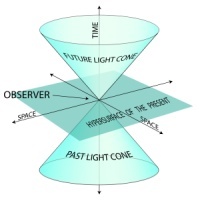 The apparent paradox of galaxies being able to recede from observers on Earth faster than light is not due to any violation of physical law but due to the discovery of the expansion of the Universe. For, in 1929, the American astronomer Edwin Hubble showed from his studies of distant galaxies that the further away a certain galaxy was from the Earth the faster it appears to be receding. One analogy used to understand the effect is to take a rubber band and draw a series of equally-spaced parallel lines across its length. By stretching the rubber band it can be seen that relative to its midpoint the lines nearest your fingers move further than those nearest the middle. So the rubber near the middle is expanding less that than further away. In other words, galaxies further from the Earth are retreating at a much greater rate than nearby ones due to the space between them expanding. In fact it was discovered from observations of distant supervovae that the space between galaxy clusters is not only expanding but accelerating. Interestingly, the actual galaxy clusters have enough mass to stay together under their own gravitational attraction. Recently it has been found, using data from the Hubble Telescope, that the Andromeda galaxy is actually approaching the Milky Way along with the smaller Triangulum galaxy. It is predicted that in another 4 billion years or so these galaxies will begin to merge with our own. So on a scale relative to a galaxy grouping the expansion of space goes somewhat unnoticed but over large timescales the large galaxy clusters will move further and further apart. Late last year a trio of scientists won the Nobel Prize for Physics for their discovery of the accelerating Universe. Prof Saul Perlmutter, Dr Adam Riess and Prof Brian Schmidt studied the brightness of distant Type 1a supernovae which are explosions marking the death of a white dwarf star. These explosions have the same peak brightness and so can be used to measure the distance to the galaxies they reside in.